Julie Cole, Co-Founder of Mabel's Labels, was presented with the “MomFirst Award” at the 9th Annual M2Moms® – The Marketing to Moms Conference. The Award is given annually to a woman who started something new when, in her own role as a Mother, she saw a need and filled it... first as a mom at home, and then in the marketplace. We recognize Julie’s business success in the creation and growth of Mabel’s Labels... And we celebrate how it started: Julie was a mom, first! Julie Cole, Co-Founder of Mabel’s Labels, a company that helps families get and stay more organized with durable and personalized label products, was presented with the “MomFirst Award” at the 9th Annual M2Moms® – The Marketing to Moms Conference, Oct. 23 & 24, 2013, Chicago. “The Award is given annually to a woman who started something new when, in her own role as a Mother, she saw a need and filled it... first as a Mom at home, and then in the marketplace,” stated Nan McCann, M2Moms® producer. “As company spokesperson, Julie is well known among North American mom entrepreneurs. Her dynamic personality makes her an in-demand speaker everywhere from university business classes to TV and radio shows, including a regular spot as parenting expert on HLN’s Raising America (Atlanta) and CH Morning Live. 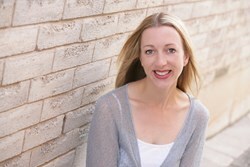 In addition to interviews and articles in major print publications, she is a syndicated blogger whose writing has also appeared in Chicken Soup for the Soul - Power Moms and numerous websites,” McCann added. For M2Moms® information: http://www.m2moms.com or 860.724.2649 x11. M2Moms,m is produced by PME® Enterprises LLC, 912 Silas Deane Hwy., Suite 101, Wethersfield, CT 06109.